Wash the soaked rice, add water just 2 cms till the upper level of rice not much water is required as the rice was pre soaked, add 1 tbsp of Ghee/ Butter, 2 cardamom, 4 clove, 1 piece cinnamon, 1 Star Anise, 2 bay leaves, 5-6 black pepper, salt to taste not much as there with be salt in the egg cooking too. Put the rice in Microwave oven for 10 mins in a closed lid container. In a bowl take the milk and add saffron or the Food Color and soak 2 3tbsp of cooked rice in it. Grind Corriander leaves, Green chillies, Garlic, Ginger, Cashew to a fine paste. Put 1 tbsp oil Fry Half of the onions till golden brown and keep aside. Put 2 tbsp of oil in a pan on low heat, add the rest of the whole garam masalas to the oil Cardamom, Cloves, Cinnamn, Bay Leaves, Dry Red Chillies, Star Anise, Whole Black Pepper, Nutmeg powder, Mace Powder, remember to put the burner on low flame or else the powder spices will be burnt and will givee a bitter taste. When the masalas give a good aroma, add half of the sliced onions, fry till golden brown, add the paste of corriander to the pan and fry till the oil seperates. Add the eggs to it, mix it well, cover and put it on low flame for 5-6 mins. 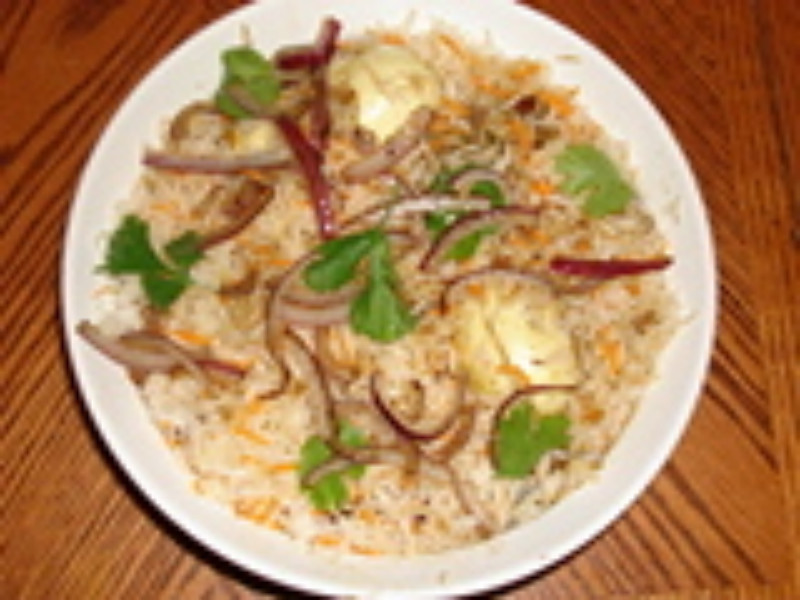 Now take a wide mouth tight lid bowl, put one layer of cooked rice sprinkle some saffron soaked rice over it, and put the cooked egg over it, then put the rest of the cooked rice over it and sprinkel the rest of the saffron soaked rice over it. Garnish with Fresh Corriander Leaves and Fried Onions. Close the lid of the Bowl, keep it for 5 mins and ready to serve. Nice recipe with a well explained method of preparation. Thumbs up!